NPR Morning Edition host Steve Inskeep is nearing the end of his Revolutionary Road Trip, a journey across North Africa to see how the countries that staged revolutions last year are remaking themselves. Steve and his team began in Tunisia's ancient city of Carthage, drove across the deserts of Libya, and filed this report from the third and final country, Egypt. In a satellite city outside Cairo, big-box stores and developments spread along a highway — among them, a complex called the Mall of Arabia, a shopping mall to match anything in Dallas. It's so new, and the floor so polished, you can almost see your reflection in it. We'd come to meet a Salafist, which refers to the earliest Muslims. Salafis today insist on a strict and puritanical view of Islam. As we traveled through Tunisia, Libya and Egypt, people talked about Salafi protests, violence against alcohol or being in favor of women wearing a niqab — a cloth that covers the entire face except the eyes. 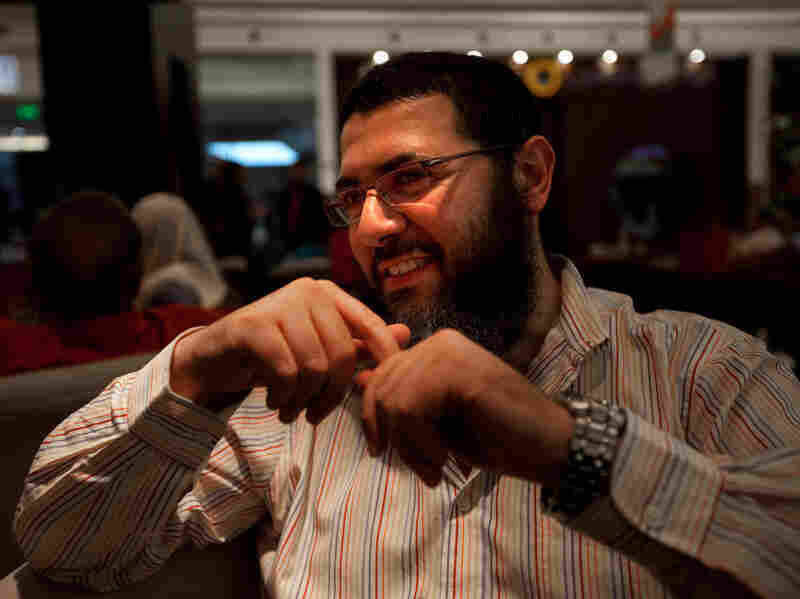 The Egyptian we were meeting, however, was a member of a distinctive Salafist faction. 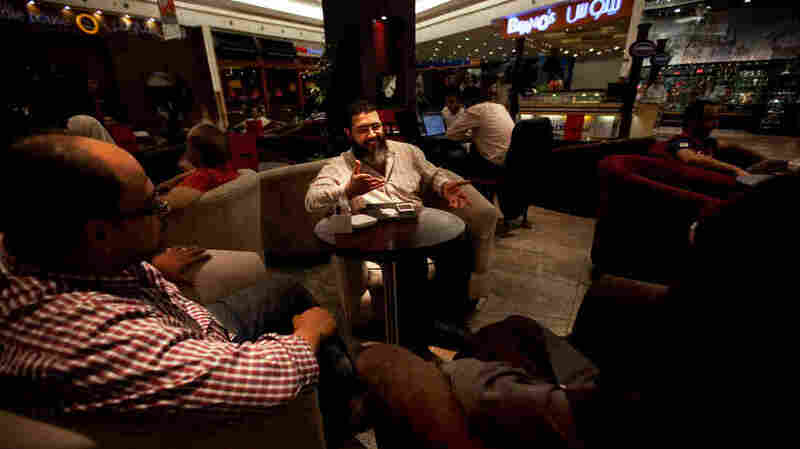 They're known as the Costa Coffee Salafists because they tend to meet in upscale coffee shops, the Egyptian equivalent of Starbucks. Tolba sports a bushy beard — a marker of religious conservatives — yet also wears Western-style jeans. He says he doesn't agree with all aspects of modern life in Egypt, yet he knows he cannot change things overnight. These Salafists' insistence on tradition does not preclude them from sipping a caramel macchiato. And naturally, we met the founder, Mohammed Tolba, in a mall coffee shop, sipping on a strawberry iced tea. "It's a national Salafi drink," he says with a laugh. Tolba, 33, an employee at an information technology firm, has a bushy beard that's a marker of religious conservatives. The Costa Salafists earned their name when friends met in a Costa coffee shop and someone made a wisecrack about the latte-drinking men with beards. Tolba soon decided to publicize the group on Facebook. "We are a movement that happened coincidentally, by chance," he says. "It was a joke, and then it turned to be something real, very real." Tolba, who checked his iPad several times during our talk, says he disagrees with people who are prejudiced against his beard, as well as Salafists who don't approve of his Western-style jeans. Many Salafists think traditional men's dress is a religious injunction. Tolba thinks it's just a cultural preference. Tolba's definition of a Salafist may differ from other factions. He says he is orthodox, comparing himself to an orthodox Christian, and that he believes in a dialogue with different people. Tolba brought along two other members of the Costa Coffee Salafists. One was a young woman who carefully moved her niqab while sipping her mocha frappe. The other was a Christian. Sitting amid the bustle of the mall, Tolba insists he does not reject the modern world. We asked what he would want to change if he controlled Egypt. "I have to accept that this is there. This is our community, this is our culture. You cannot change it; it takes like tens of years," Tolba says. "I might not accept everything there, but I cannot change it culturally." Listening carefully to Tolba, you sense he would like to change people over time. And he's willing to discuss it. That's a meaningful distinction, because we found during our 2,700-mile journey that not everybody is willing to talk. In Tunisia, Salafist demonstrations have led increasingly to violence. In Libya, we saw protesters with machine guns, holding up signs declaring democracy incompatible with Islam. You can say the Arab world faces a divide between liberals and conservatives. A more important divide is between people who listen to others, and people who insist that others must do as they say.